1335MABINI proudly presents Manny Montelibano in a solo exhibition titled “Here, distorted” from February 18 – April 15, 2015. 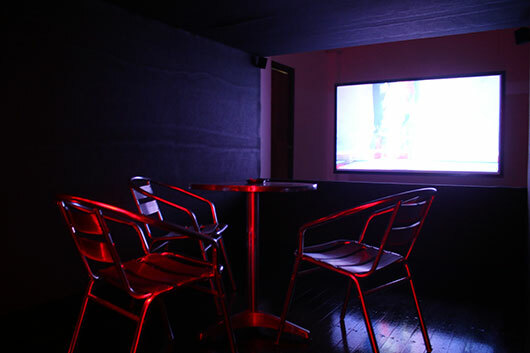 Amplifying the voyeuristic quality of the work is a small makeshift room with a low ceilingwithin the exhibition space, placed a few feet away from the projection screen, where viewers could sit and stand by while watching the video. A red velvet curtain covers the entire length and width of the entrance to the room, further complimenting the deluge of visual and sound elements with a claustrophobic ambiance. The simulation is made complete with the olfactory component distinguished to be from cigarettes and alcoholic beverages. The installation and its level of engagement draws inspiration from TAPP und TASTKINO (TOUCH and TAP Cinema), the performances of Austrian Artist VALIE EXPORT where she called for people to touch her breasts through an enclosed box that she placed on her chest. Screened in a gallery space right in the middle of Manila’s red light district, the video mirrors the immediate state of affairs: a chaotic capital overrun by a motley population comprised of tourists, street dwellers, prostitutes, professionals, job hunters, artists, construction workers, peddlers, etc. Montelibano likens the impression from the local urban development to hogwash – not suitable for human consumption / habitation.